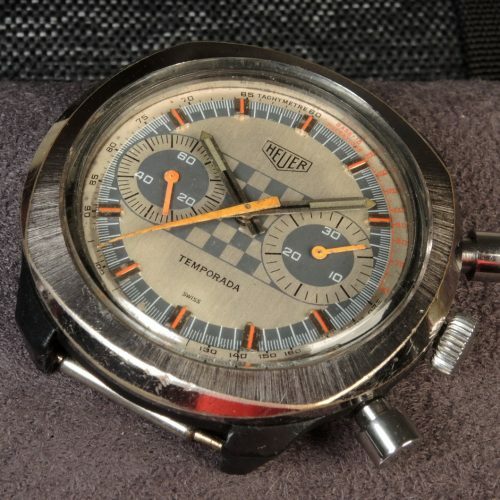 We have added Heuer’s 1961 catalog to OnTheDash. 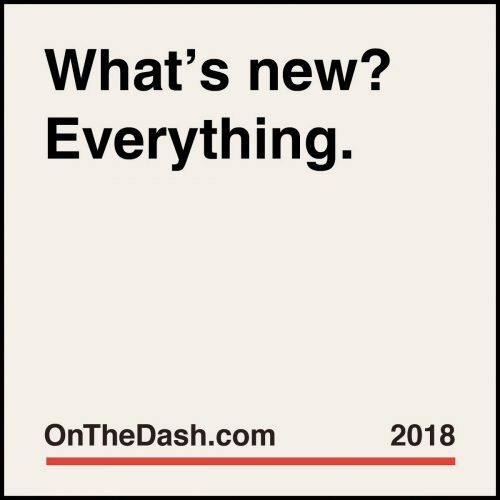 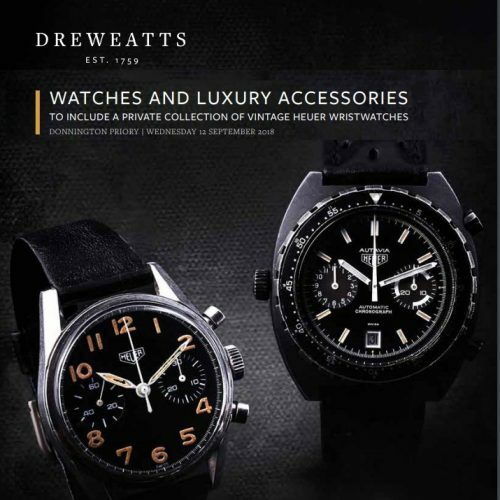 There are several interesting aspects of this catalog. 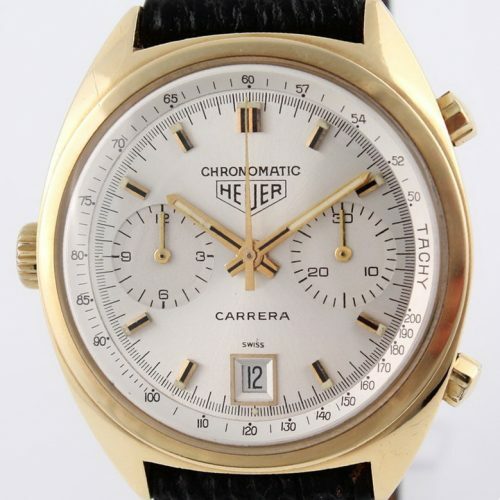 Throughout the 1960s, Heuer offered a line of “Economy” chronographs. 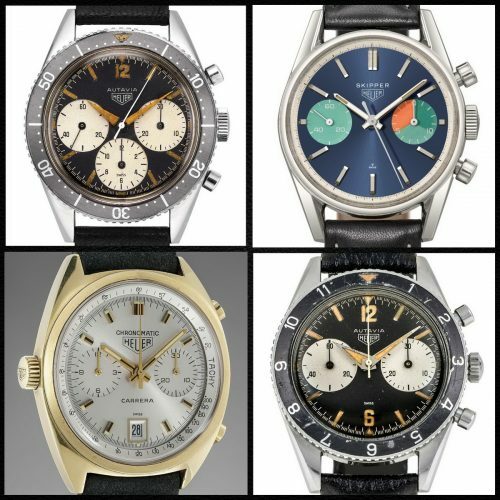 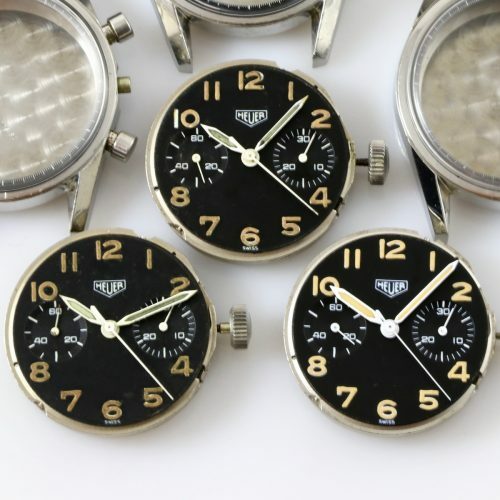 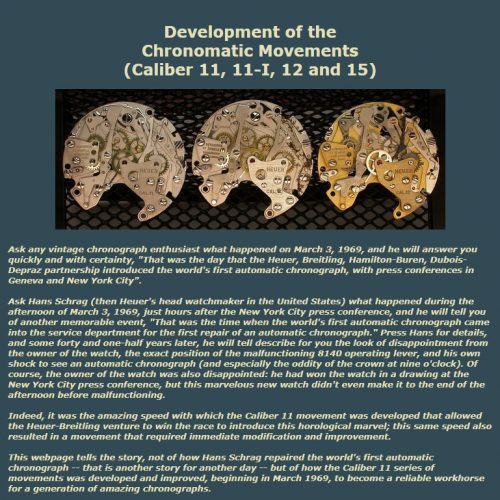 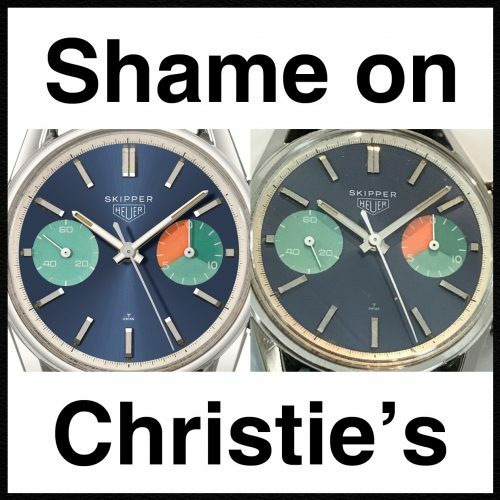 These Economy chronographs used the same movements as Heuer’s standard production models (Autavia, Carrera, Camaro, etc. 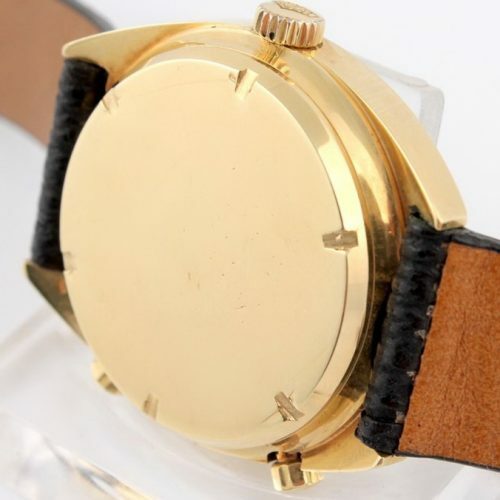 ), except that the cases on the Economy models are nickel-chrome plated or gold-plated, rather then being either stainless steel or gold (14 karat or 18 karat). 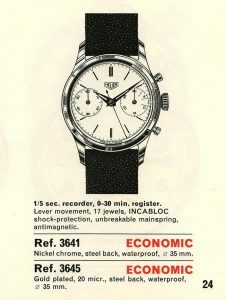 The 1961 catalog was the first Heuer catalog to refer to “Economic” models. 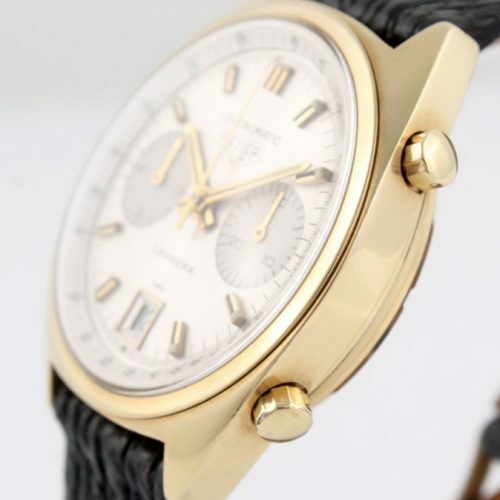 We see this designation for the Reference 3641 chronograph, with a nickel-chrome case, and the Reference 3645, with a gold=plated case. 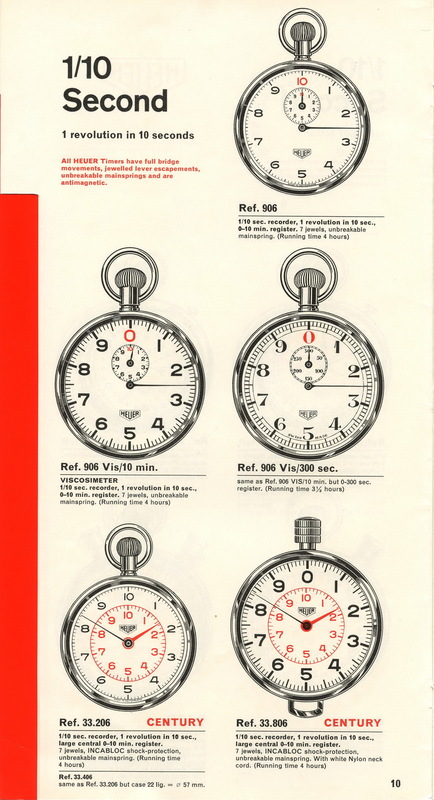 Checking the price list that accompanied the 1961 catalog, we see just how “economic” these models were, with the Reference 3641 priced at $85.00 (Canadian), compared with $100 or $110, for the comparable two-register stainless steel models. 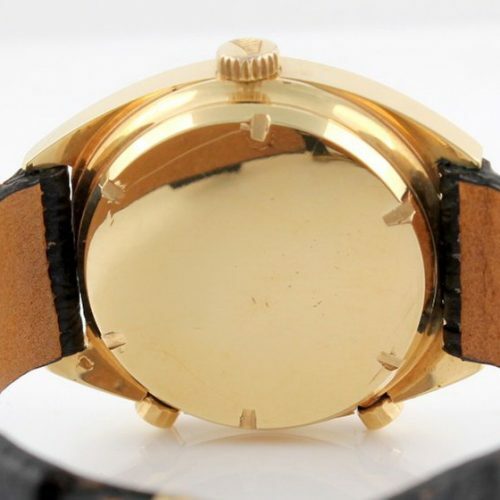 The gold-plated Reference 3645 is priced at $89.50, compared to $240.00 for the 18 karat gold model. 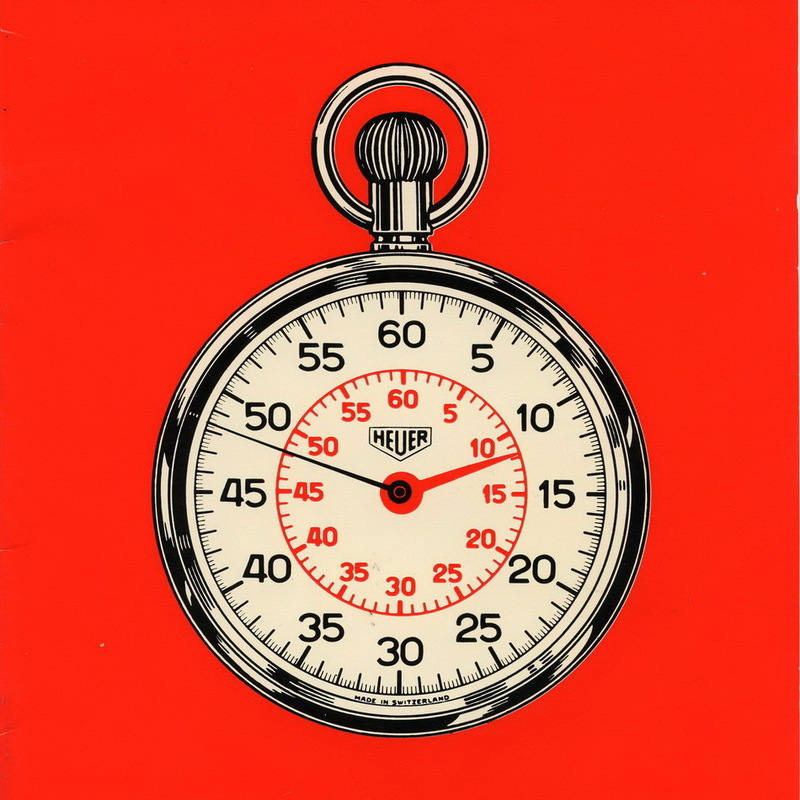 The 1961 catalog was Heuer’s first use of a red catalog, measuring approximately 6-1/4 inches by 11-3/4 inches. 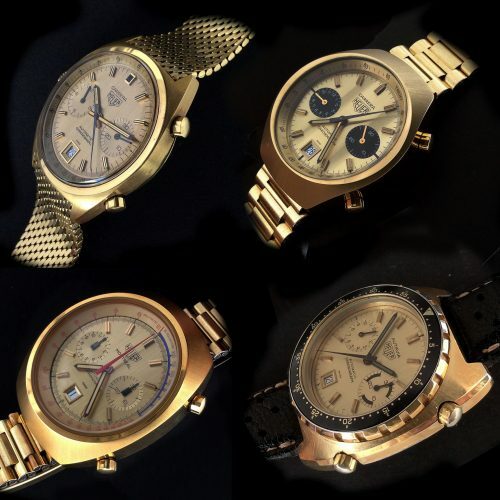 Heuer would use this format through 1965 / 66, and they are among the favorites of collectors. 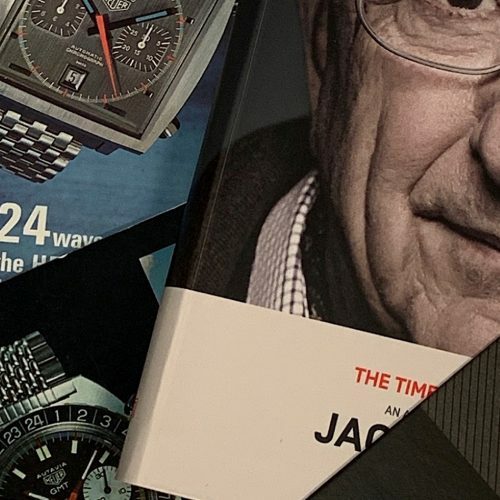 All these catalogs used the Helvetica type, a popular sans-serif typeface developed in 1957 by Swiss typeface designer Max Miedinger. 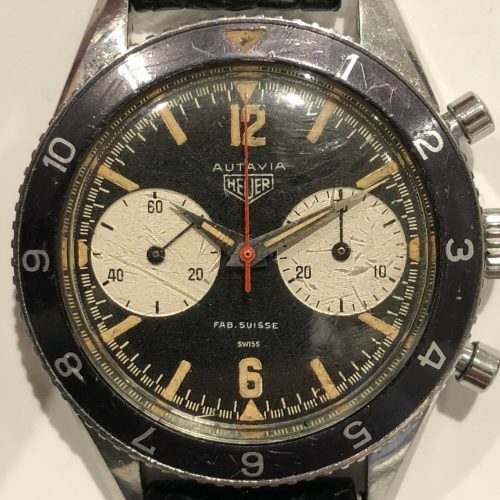 This Swiss modernist style captured the style of Heuers in the 1960s (and it is also the typeface used on the new OnTheDash website). 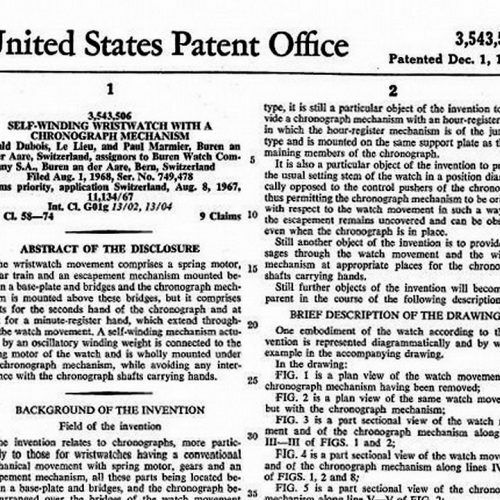 The Reference 2915 stopwatch that appears on page 5 of the 1961 catalog was used by John Glenn, for his February 1962 Mercury flight. 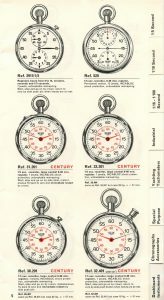 This stopwatch had been introduced in the late 1950s. 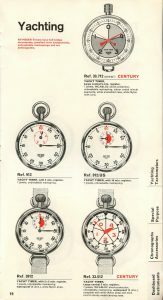 Page 19 of the 1961 catalog shows five stopwatches for Yachting. 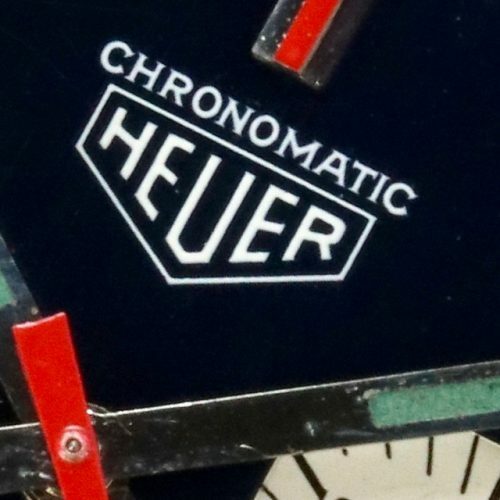 The Reference 912 and Reference 3912 models are Heuer’s traditional configuration, with a 5 or 10 minute register for the countdown. 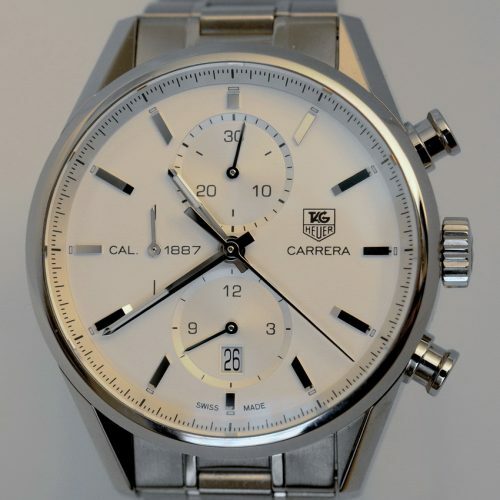 The newer Reference 33.712 and Reference 33.512 models use Heuer’s “Century” design, with the central minute register guaranteeing 85% better legibility. 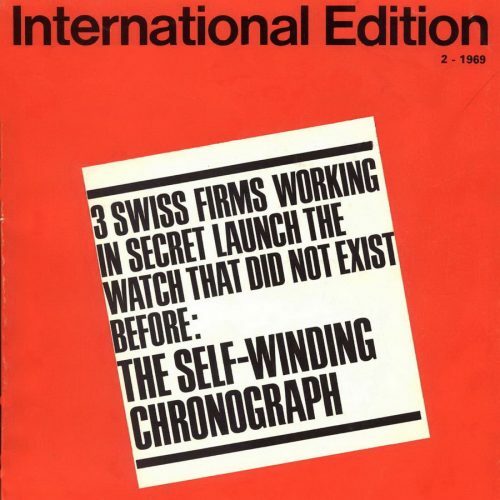 The Century design had been introduced in 1960, to mark Ed. 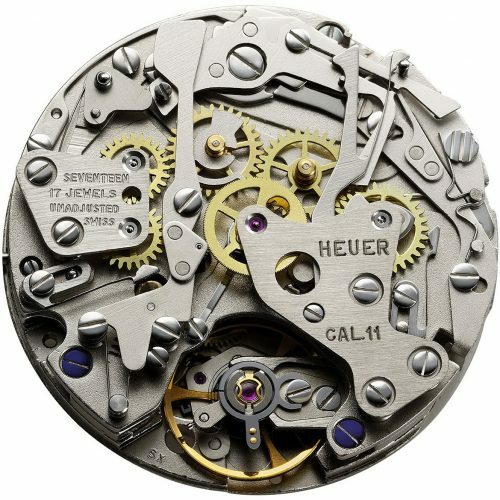 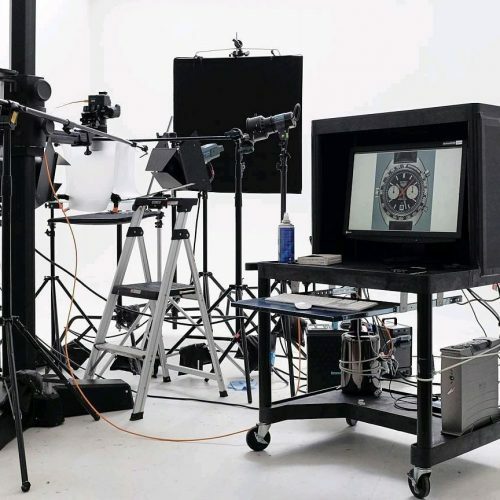 Heuer’s 100th year in the timepiece business. 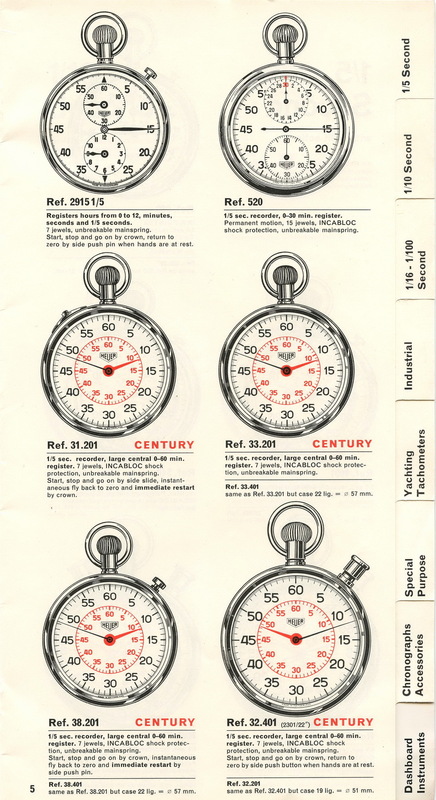 Describing all the unusual stopwatches in any particular catalog would be an endless task. 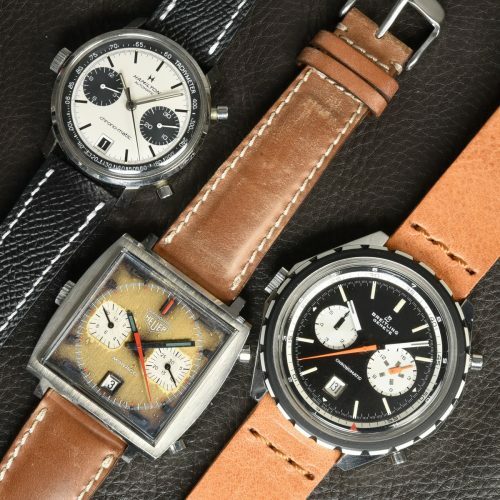 On page 10 of the 1961 catalog, we see five stopwatches that have 1/10 second timing, with the second hand making one revolution in 10 seconds. The Reference 906 Vis (Viscosimeter) has a capacity of 10 minutes and a running time of 4 hours; the Reference 906 Vis / 300 seconds has a capacity of 300 seconds (five minutes) and running time of 3-1/2 hours. 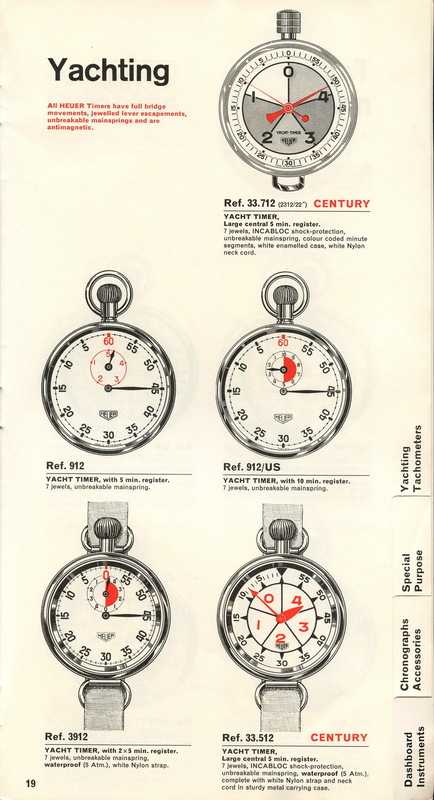 We can assume that these stopwatches were used for some scientific or industrial application relating to viscosity. 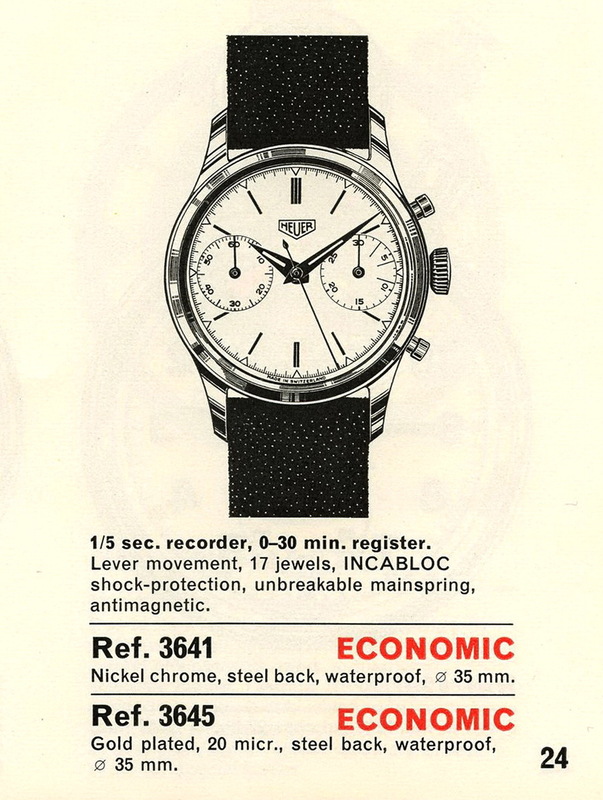 Included with this catalog is a Price List published by The Chronometric Company Limited, Heuer’s branch in Tornoto, Canada. 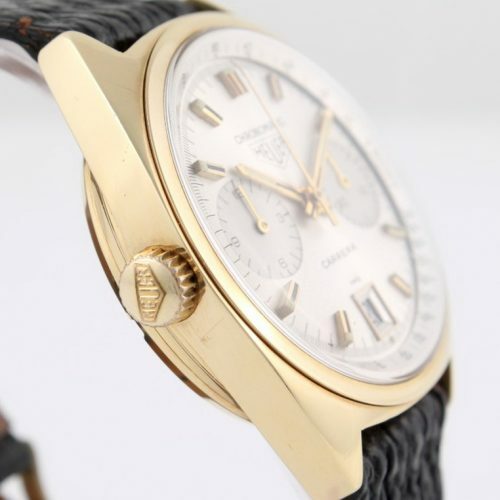 The exchange rate for Canadian dollars to U. S. Dollars was in the range between $0.95 and $1.02 U.S. 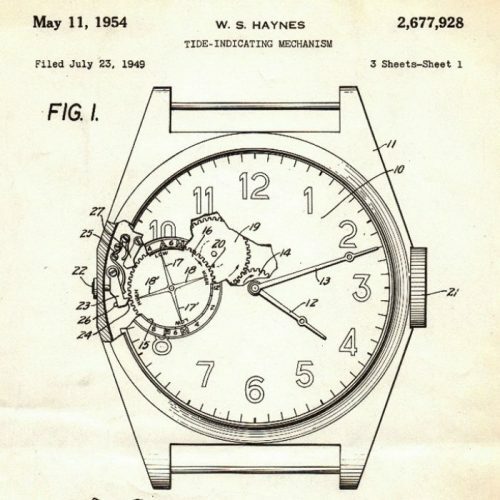 Dollars per Canadian dollar throughout 1961, so it is easy to translate this Price List into U. S. Dollars.